We may be in the height of summer heat, but before you know it we will be reveling in Fall's beauty. 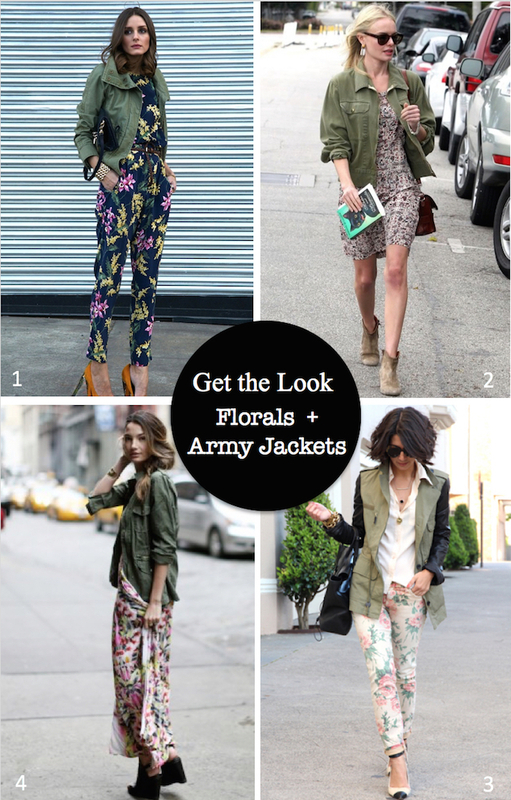 Such is why I'm loving the transitional look of feminine floral prints and army jackets (see how I style it here). Great now to wear on a chilly evening and the perfect jacket to take floral clothing into fall, take a look at celebrities and bloggers style army jackets and floral prints. 1. Go full force fashionista like Olivia Palermo and rock a chic army jacket with a bold floral jumpsuit. 2. Festival style queen Kate Bosworth made gave made her boho vibe city chic by pairing her lightweight army jacket with a breezy floral dress and ankle booties. 3. This Time Tomorrow blogger created a downtown polished look by pairing an updated army jacket with feminine floral jeans, a classic collared shirt and pumps. 4. For a casual date night or concert in the park, pair your favorite floral print maxi dress with a light weight army green cargo jacket like Lily Aldridge.